SA coach Marcos Ondruska admits he still doesn’t understand what went wrong. 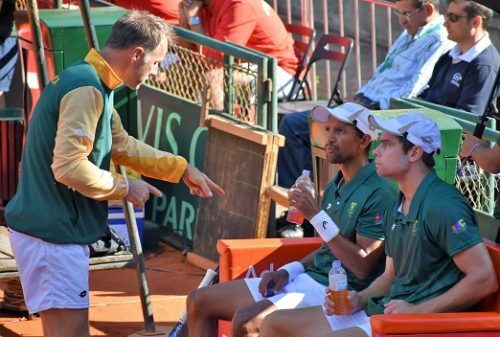 The national men’s tennis team will compete in Group 2 of the Davis Cup Euro-Africa division next season, after being handed a crushing 4-0 defeat in their relegation tie against Portugal in Lisbon at the weekend. The South Africans were completely outplayed from the start, as the host team displayed total dominance on the slower clay surface on Friday, with Pedro Sousa beating Lloyd Harris 6-1 6-1 in the opening singles rubber and Joao Sousa outclassing Nik Scholtz 6-3 6-2. Portugal secured victory in the Group 1 tie on Saturday, with Joao Sousa and Gastao Elias handing the powerful SA duo of Raven Klaasen and Ruan Roelofse a rare 6-4 6-7(4) 6-2 defeat in the doubles rubber. Later on Saturday, in a dead rubber singles contest, Joao Domingues beat teenager Philip Henning 6-4 6-0. “It was a tough loss and I am still trying to understand where we went wrong” said SA captain Marcos Ondruska.